Charles Colson, the former Nixon special counsel-turned-Christian radio commentator, told his listeners God allowed Hurricane Katrina to remind the United States how important it is to win the “war on terror”. That’s the way folks like Chuck Colson think. God talks to them. It may sound weird to most folks, but if you claim to be in hourly contact with God, reading the headlines together, who can say the message from Above was garbled. The real problem comes when politicians claim divine guidance for their actions. That was certainly the case when United States Senator Chuck Schumer (D/NY) told a radio interviewer that he was Israel’s “guardian” in the Senate, a role given to him by Hashem (God). 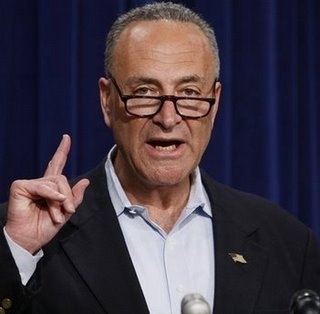 Speaking on the politically conservative Jewish Nachum Segal Show, Schumer told his interviewer that he had warned the White House he would “blast” the Administration if the State Department did not back down from its “terrible” tough talk toward Prime Minister Benjamin Netanyahu. You have to show Israel that it’s not going to be forced to do things it doesn’t want to do and can’t do. At the same time you have to show the Palestinians that they are not going to get their way by just sitting back and not giving in, and not recognizing that there is a state of Israel. Right now there is a battle going on inside the administration, one side agrees with us, one side doesn’t, and we’re pushing hard to make sure the right side wins and if not we’ll have to take it to the next step. Schumer was not just speaking on behalf of his New York constituents. He was speaking as Israel’s guardian on behalf of Hashem (God). One thing I want to assure your listeners, Nachum, my name as you know, comes from a Hebrew word. It comes from the word shomer, which mean[s] guardian. My ancestors were guardians of the ghetto wall in Chortkov and I believe Hashem, actually, gave me [that] name as one of my roles that is very important in the United States Senate [is] to be a shomer for Israel. I will continue to be that with every bone in my body for of the other is [sic]against me. Since his days as a Brooklyn congressman, Schumer has been a staunch defender of Israel. His defense stepped up when a president of his own Democratic party moved into the White House. In February, 2010, a month after President Barack Obama took office, Schumer unashamedly emerged as Israel’s defender in all White House decisions. The Obama administration has just suffered an embarrassing defeat at the hands of the lobbyists the president vowed to keep in their place, and their friends on Capitol Hill. The country has lost an able public servant in an area where President Obama has few personal credentials of his own — the handling of national intelligence. Charles Freeman, the man who was slated to be chairman of the National Intelligence Council, the high-level interagency group that prepares evaluations for the president and other senior officials, suddenly withdrew his name Tuesday night. I know it was a sudden decision because I had breakfast with him that morning. He said then that he thought he could ride out the storm caused by his outspoken comments on policy toward China and the Middle East — and the enmity that he had incurred from lobbies supporting Israel and human rights in Tibet. After losing that appointment, Freeman returned to his role as president of the Middle East Policy Council. Had Freeman been allowed to serve as Obama’s National Intelligence Council chair, he would have brought to the post long experience in international affairs, including assignments as Assistant Secretary of Defense for International Security Affairs from 1993-94, service with the Department of Defense where he designed a NATO-centered post-Cold War European security system and the reestablishment of defense and military relations with China. None of this matters to a politician like Chuck Schumer, for whom love for Israel will trump experience and knowledge every time. When the country lost the services of Freeman, it lost a man with extensive experience in foreign affairs, an articulate writer who, no doubt to Schumer’s regret, recently described how damaging Israel is to world politics. Washington has made Israel our largest recipient of foreign aid, encouraged private transfers to it through unique tax breaks, transferred huge quantities of weapons and munitions to it gratis, directly and indirectly subsidized the Israeli defense industry, allocated military R&D to Israeli rather than US institutions, offered Israeli armaments manufacturers the same status as US manufacturers for purposes of US defense procurement, etc.. Almost all US vetoes at the United Nations and decisions to boycott international conferences and meetings have been on behalf of Israel. Israel treats its ability to command support from Washington as a major tool of diplomatic influence in third countries; it does not exercise its very limited influence abroad in support of US as opposed to its own objectives. Meanwhile, American church bodies, the presumed guardians of goy values, refuse to take even modest steps on Boycott, Divestment and Sanctions (BDS) to protest both Israel’s control of US foreign policy and its unchecked violations of Palestinian human rights. I simply refuse to believe Hashem would sanction Senator Schumer’s defense of such conduct. In fact, I believe Hashem supports BDS. This entry was posted in Middle East Politics, Politics and Elections, Politics in Religion. Bookmark the permalink. I suspect that it is through the churches that BDS will get traction and move to a mainstream constituency, just as has happened with all our important social justice movements. Sabeel just had about 1400 people at conferences in three churches here on the West Coast and Hawii. In all three conferences BDS came into a larger tent. And on May Day Sabeel Puget Sound had 62 people at a day-long BDS workshop, gathering Christian, Muslim, Jewish and secular activists to work on strategies and focus. Presenters talked about the cultural/academic boycott, Jewish Voice for Peace’s focus on divestment from TIAA/CREF’s pension fund and Palestine Solidarity Seattle talked about their work to identify produces and stores selling them. (http://www.palestineinformation.org/main.htm ) A local Muslin leader described a successful campaign to stop SSI from offering anti-Arab and Muslim training with Microsoft and our local police and State Patrol. All through the group were members of different churches who will take BDS back with them. We will meet again in October to focus on movement building. Churches have been slow to come to this issue. But it’s starting to happen. Thanks for revealing what damage to the US national security in both, blood and treasure, shady figures like Schumer have contributed and continue to contribute to the detriment of US National interests. Any member of Congress who places Israel’s perceived interests above those of the US should raise many questions. Perhaps if the “American church bodies, the presumed guardians of goy values” would LISTEN to who and what they are supporting: RACISM-they will wake up and change course? Among the far right racist demonstrators were members of CUFI, The Republican Jewish Coalition, the Zionist Organization of America, Z Street, Americans for a Safe Israel, , and Manhigut Yehudit, an anti-democratic group that calls for theocratic rule over Israel. Hurrah==now how do we separate church and state? there must be some way of judging the Israeli policy in terms of human failing, and dismissing any connection with a chauvinistic God. Church and state must be separate from all Gods, of all nationalities, and humane behavior must be demanded in all cases. How will you influence our government to go by the rules and judge objectively in accordance with the best U.S. interests, and democratic human principles.? I cry when I read thoughful observations of the Middle East struggle. My father (1905-87) said he was convinced the Israeli/Palestinian problem would not be solved in his lifetime. I cannot accept the thought that major progress won’t be made during my lifetime (1941-???). If the USA won’t see through its being manipulated and look out for its own interests, e.g. avoiding nuclear war with a new “Persia,” can’t it at least apply the moral values that unerlay the creation of its own nation, i.e. freedom for and tolerance of all God’s children? Obama….here comes annother zionest puppet!! !